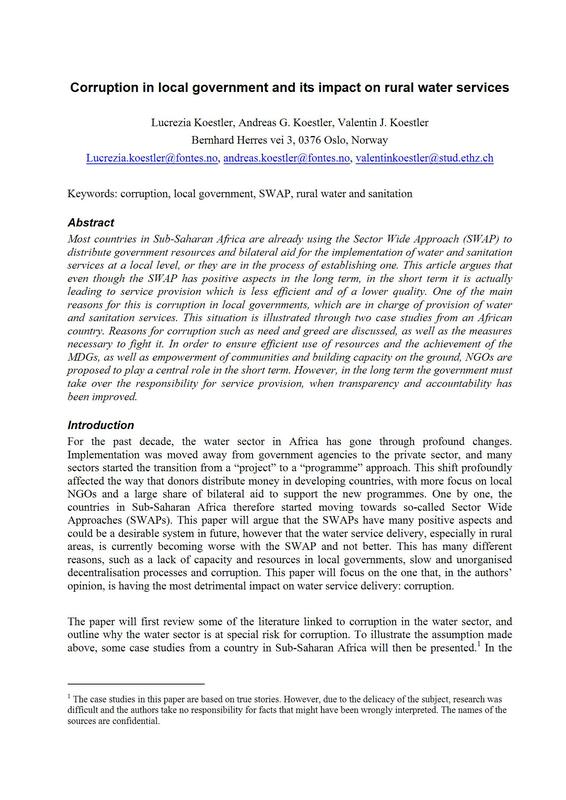 Most countries in Sub-Saharan Africa are already using the Sector Wide Approach (SWAP) to distribute government resources and bilateral aid for the implementation of water and sanitation services at a local level, or they are in the process of establishing one. This article argues that even though the SWAP has positive aspects in the long term, in the short term it is actually leading to service provision which is less efficient and of a lower quality. One of the main reasons for this is corruption in local governments, which are in charge of provision of water and sanitation services. This situation is illustrated through two case studies from an African country. Reasons for corruption such as need and greed are discussed, as well as the measures necessary to fight it. In order to ensure efficient use of resources and the achievement of the MDGs, as well as empowerment of communities and building capacity on the ground, NGOs are proposed to play a central role in the short term. However, in the long term the government must take over the responsibility for service provision, when transparency and accountability has been improved.